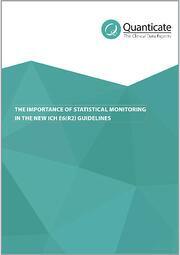 Within this whitepaper you will be introduced to risk-based monitoring (RBM) and its four major components: this includes Statistical Monitoring (SM) and the creation of the Statistical Monitoring Report (SMR). SM within RBM is an approach using statistical algorithms for identifying and managing issues affecting data integrity such as non-random errors and GCP misconduct including fraud (either intentional or non-intentional) at investigational sites. In addition you will find six further data parameters that recently caught the attention of study management teams that can be included in a SMR to ensure a risk-based approach is successful in response to the recent ICH GCP E6(R2) addendum.